Great men, who overcame failure and blindness, changed the world. Benjamin Franklin made life better for the early American colonies. He designed the first public library. Amazingly, the lightning rod, which was an invention of Ben Franklin, is used even now. He also interestingly improved a stove to have two times the heat with less wood. But if you want to cook with a stove, you need to see better. 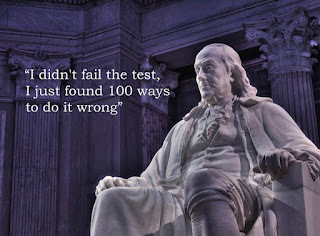 That's why Franklin made bifocals. They help people see near and far. He didn't patent his inventions because he wanted people to copy him. Benjamin Franklin figured out how to fix the colonies with ingenious devices. 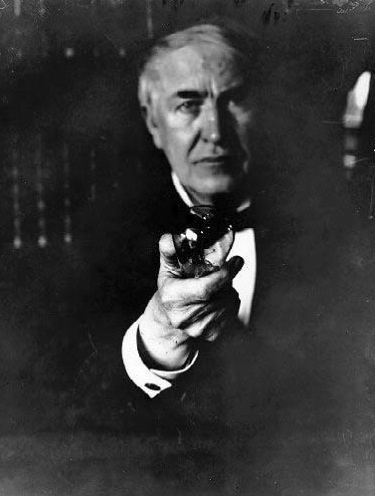 Thomas Edison changed the world because he made 1093 ingenious devices. He made light bulbs and movie projectors, which were his favorite. He fixed batteries and telephones. He did not give up. He also was homeschooled. Amazingly, Thomas Edison spoke, "I have not failed. I have just found 10,000 ways that don't work." Thomas Edison diligently changed the world with his awesome devices. These great men changed the world for the better while never giving up.